I have just started my second gallon of weight check on our mare this winter. 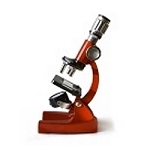 A friend mentioned she looked underweight so I began researching and found The Natural Vet products and information. I wanted her to gain healthy weight on good products not junk food. She had added weight slowly and now has a pleasing appearance for the winter and loves her weight check oil and her just add oats. I started feeding Red Cal, Just add Oats and Bug Check to my two rescued Curly horses that I brought home a year ago and the results have been astonishing. Better body condition, better coats, fewer flies. 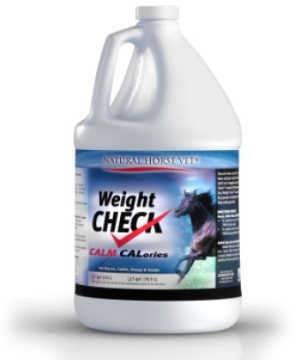 I added Weight Check Oil when my pregnant mare started losing weight and condition. It worked!! I am well pleased with the products Dr Dan provides! Early in the summer my vet informed me that my older horse probably was suffering from cushings. 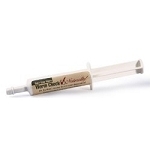 Not having the money to run all the tests, I decided to start her on Natural Vet products. After calling and talking with the very helpful staff, they suggested I start her on the Weight Check Oil. She has shed most of her excess hair and seems to be doing much better instead of the fatal diagnosis that goes along with cushings! I recently added Bug Check and now Red Cal. I'm so relieved that both of my horses are on natural products! Parader's Mack, my TWH had developed a horrible skin condition which lasted over a year. He scratched himself until his skin had open bleeding sores. Nothing i tried helped at all, including coconut oil (both topically+orally) and everything else i could find...Not until i found Dr Dan's Weighjt Check oil and Red Cal. Now we are at an unbelievable 85-90% improvement and going for 100% Thank you Dr Dan!! Ground-covering January snowfall, while pretty, also means my mare is drinking less water, but consuming more hay in the wet, cold conditions. Keeping water in the bucket fresh, ice-free and a good drinking temperature is important, but as they say, "you can lead a horse to water, but can't make him (or her) drink." That is where Natural Vet products like Weight Check oil help ensure that my mare is getting good fat in her diet that not only helps with winter weight maintenance, but also assists in processing hay in the gut, and avoiding compaction issues. My horse has no problem eating this. 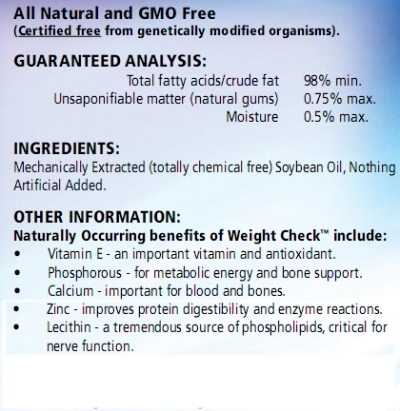 I had been giving all my horses another omega in the form of ground flax seed from a reputable company. As we live in a warm climate, it is my habit to check all feed products used half way down the container. 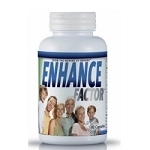 Upon inspecting the flax seed supplement I noticed it tasted funny. I didn't give it to my horses. I was told by my local feed store that it was rancid. 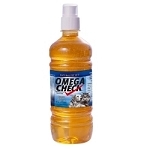 I then purchased weight check oil and have had no problems of this kind. Weight Check Oil holds its integrity. Love the Weight Check Oil! 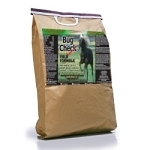 I use this with the Just Add Oats and other Natural Vet supplements. After stirring, it helps to stick all the supplements to their oats, so they're more likely to eat every bit of it. My horses absolutely LOVE the taste, and I love the smell after I mix it all up. It smells so good and healthy! Makes me happy to know that's what I'm feeding my horses, and of course they're happy to be receiving it! Weight Check Oil gives their coats a beautiful shine and deep color. I learned early on to limit the quantity, or they will fatten up! It only takes a small amount (I feed them one ounce a day) and that's all they need. 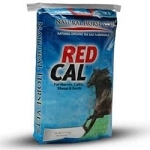 This is a great, safe product for my horses. Their coats are shiny and soft, their weight is optimal, and their disposition is calm and relaxed, except when I have carrots! I love that I don't have to worry about unwanted ingredients in this supplement, and I have worry free feeding with The Natural Vet!!!! We have an 8 year old Morgan/Saddlebred mare who has very creaky joints in her legs. Her joints crack when she walks - just like if we were cracking our knuckles. We've asked our local vets about it and worried for years, but no one had any answers. She doesn't seem uncomfortable, but it doesn't seem like a good thing. I decided to try weight check, not to add weight to her, but to give her extra Omega 3's to see if that would help. We've been using it now for a couple months and we rarely hear the cracking noises from her joints anymore. I'm convinced the Weight Check oil is helping her stay healthy as a whole. (She also gets Just Add Oats and is pasture boarded on grass). I love this produce especially in the summer when my horse Rocky's coat is so shiny people ask me what I feed him(and of course I tell them about Dr. Dan's products)But even in the winter when he is so muddy I can still see a shine when I get the mud and dirt off! Best Weight Gain Product - EVER! My OTTB couldn't keep weight on in the winter, and we tried everything- corn oil, flaxseed oil, beet pulp, rice bran, etc. Within three months he gained 50 lbs, and has maintained his weight through four winters in upstate New York, without a blanket! I like that it's all natural and non-GMO, and the horses love it. Over the last 2 years my older gelding dropped a lot of weight and his overall body condition was starting to decline. I decided to give the Weight Check a try - so glad I did! On 4-5 ounces per day he finally looks like a normal, healthy horse again. Be patient, though. I also feed this at a maintenance-level to my other 3 horses who are on the full feeding program, and it took us until the 3rd 1-gallon container to see a big difference in my gelding. I will never be without this for him! I bought a gallon of Weight Check this winter because my 30 yr old mustang seemed to be having trouble keeping up his weight during our very cold winter days. This product really helped him keep warm and he started putting on weight and his coat looks lustrous and shiny. 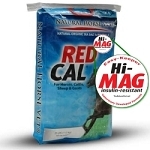 I would recomment this product for any horse for improving their health. My Morgan and lost some weight last winter so I started him on Weight Check right away in the spring. It didn't take long for the weight to come back on and gives a great shine to the coat.